Greece is one of the most beautiful countries in South Eastern Europe. It is also the birthplace of Western civilization and Athens. They have thousands of islands between Aegean and Ionian seas. The country is also very famous for its beaches. Santorini is the most famous island among the visitors because of the black sands. Oia in Greece is one of the most beautiful small towns in Europe that you should visit. The party resorts in Mykonos are also very famous. Greece is the cradle of Western civilization and home to some of the most beautiful natural wonders of the world. Greece offers a unique blend of breathtaking landscapes, exciting sports, and historic monuments. Here is a list of the ten most beautiful Greek islands that every tourist must visit! Santorini without a question is the most beautiful and popular island among the tourist around the world. It has an amazing landscape, archaeological sites and beautiful villages which attract lakhs of tourist every year. This popular Greek island attracts thousands of tourists each year which throng to see the pristine blue waters and the cliff city with small white houses and churches with peculiar blue domes. Fira is the capital of this island and has many small restaurants and cafes that cater to tourists all year round. Oia is also one of the famous cities on this island and is the ideal place to watch sunsets. This city has narrow Criss-crossing streets and most tourists prefer to explore this city on foot. This Greek island has beaches with red, white and black coloured sands with crystal clear waters and amazing views of the Andean sea. This island also offers many water sports like sailing, diving, kayaking, snorkelling, and swimming. We have also listed best beach cities in the world. Crete is the largest island in Greece. It is located in the Southern Aegean Sea. The island is famous for mountains, gorgeous valleys, splendid beaches, rich history and friendly people. The White Mountains in the West part of Crete Island are one of the most visited places in the country. The coastline of the beach is 650 miles long and covers more than 100 beaches. The marine life of the island is also very amazing. Because of its history, beautiful landscape and friendly people, this island attracts a large number of tourists. Balos, Elafonissi, Vai, and Preveli are some of the famous beaches in Crete. They have clear emerald waters and perfect snorkelling sites which offer stunning views of underwater life. This Greek Islands famous for trekking. The White Mountains in the western part of the island are a remarkable feature. They are covered in snow during the winter and as summer arrives, the underlying white rock is exposed. The White Mountains are a trekkers paradise. You will also love to read about a few Florida beaches known for their natural beauty. The beaches of the island are famous for its clear blue waters. The island is surrounded by high limestone cliffs and the beautiful beaches can be reached by boats. 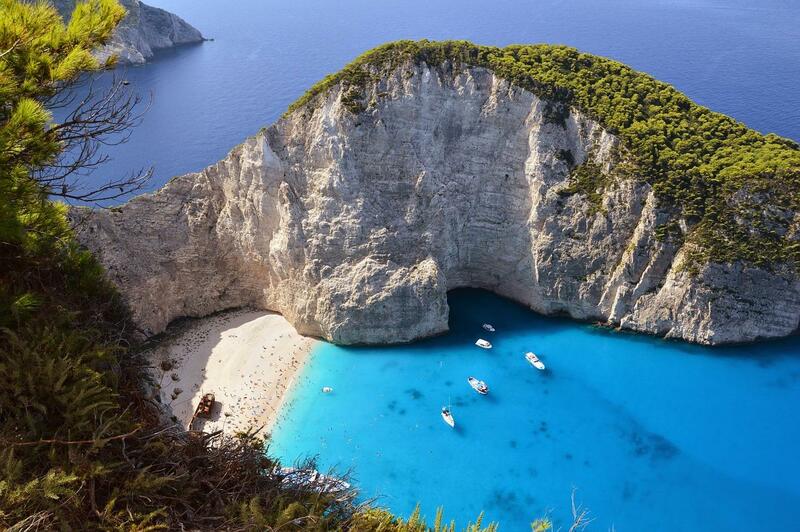 The Navagio beach is the most famous beach of the island. The blue caves that are located on the Northwest coast are one of the most beautiful natural wonders of Zakynthos Island. The most famous attraction of this island is the Navagio beach which is remote and yet very popular. One has to travel by boats to reach this beach and it is also called the Shipwreck beach because of a wrecked ship that was abandoned on the coast of this island by pirates. Another famous beach is Turtle Island which has a pebble beach and a golden sand beach. The blue caves are a wondrous sight and stand tall in the middle of the turquoise blue waters. The many cliffs adjoining the beaches offer excellent views of the beaches and the famous blue Aegean waters. The island is famous for its old history and ancient ruins. It is also famous for its villages and beautiful beaches. The palace of the grand masters is one of the most famous places on Rhodes Island. The archaeological museum of Rhodes has the amazing collection of artefacts that have been extracted from the island a long time ago. The butterfly valley located in the Western part of Rhodes Island is worth seeing. This island is well known for the many ruins and historic ruins it houses as well as natural wonders. There are many castles, caves, museums and archaeological excavation sites all over this island. The villages have dainty houses and scenic roads. The beaches are famous for their sparkling clear waters and white sands. A famous attraction is the butterfly valley where thousands of butterflies gather in the spring and tourists can take a walk through this lush valley in the midst of the flying beauties. One of the most famous Greek Islands in the world. There are many villages that have been built on cliffs and are major tourist attractions. It is the biggest island in the Ionian Sea. The landscape and the mountains are just amazing and breathtaking. It is one of the most beautiful places you must visit if you are planning for Greece. The cave of Melissani is one of the amazing places in Kefalonia Island. There is also a beautiful lake and it is 25 30 meters deep. The boat trip to this lake is a lifetime experience with your family. This Greek island is located in the Ionian Sea and is a major attraction because of its calm waters and clean sands. The famous underground cave of KMelissani is truly a wonder of nature. It is 3.5 kilometres wide and 40 meters wide and is so large that it has a large lake inside it. The lake has deep blue waters and looks stunning when sunlight falls on it through the roof. The calm blue water has made it a popular spot for kayaking and scuba diving. The marine life surrounding this island is very rich and one can see the unique Mediterranean ecosystem from this island. Caribbean Islands are also famous among tourists for their amazing locations. We also recommend you read about some of the most unusual beaches in the world. The island is located in the Southwest of the mainland of Greece. The island is famous for its beaches, landscape, sandy beaches and the list goes on. The island is also home to many churches that were built between 15th and century. The island has 25 spectacular beaches. This Greek island has 25 beaches with soft golden sands and electric blue water. It is also famous for the tiny scenic villages and the rustic countryside. The nightlife of this island is very vibrant and it offers many restaurants, cafes, and bars. Whitewashed churches from the 15th to 17th century add a touch of white to this island and are a must visit for the history and architecture enthusiasts. The windmills located on hills are a tourist attraction and look most beautiful at sunset. The island is located on the Northwest coast of Greece. It is famous for its ancient ruins and natural beauty. The UNESCO registers two Venetian forts that are situated on the island. The museum situated on the island has also many ruins of the ancient world. The museum has a huge collection of archaeological findings. The island has dense forests and amazing cliffs. There are many water sports also that you can enjoy on the island. Corfu is perhaps the most famous of the Greek islands and the main town has been declared a UNESCO world heritage site to protect its unique architecture including two Venetian forts. It has winding roads and the Esplanade – one of the largest public squares is located on this island. For the ones who prefer a more active holiday, the 136-mile Corfu trail is an absolute delight as it passes through rugged mountains and dense Mediterranean forests. There are over 50 beaches on this island and all of them offer different kinds of water sports as well a variety of authentic Greek food be the seaside. It is one of the best Greek Islands known among tourist. Thailand is also known for its beautiful beaches, here is a list of beautiful islands in Thailand to visit. The island is located in Western Greece. The island is famous for its historical sites and monasteries. There are around 21 beaches sandy beaches on the island. There are many other beautiful beaches on the island namely Egremni, Kathisma, Agios Ioannis and Milos. The Agia Mavra castle is a 14th-century castle that has been built by Sicily ruler Loannis Orsini. The fort has amazing fortress architecture. This island in Western Greece is one of the most popular tourist destinations because of the wide variety of activities it offers. It has breathtaking landscapes of lush green cliffs beside beaches and picturesque villages. Apart from the 21 magnificent beaches with golden sands and sparkling blue waters, the island also has many sites of historical significance. This includes monasteries, the Agia Marva castle as well as many archaeological sites. The Dimosari waterfall on the Island is also a famous tourist attraction because of the natural pool that fills up during summer and the forest trail that leads up to it. Greece is also famous among tourist as best nightlife cities of the world. This small island beside the famous Crete is a lesser known destination. However, it offers the most beautiful sites despite its small area of 7.7 square kilometres. The quiet beaches and offer the perfect place for un-cluttering your mind and enjoy the sunset. The Simos beach is the most famous on this island and is popular with families. It also has many camping sites and offers boat rides on the blue waters at sunset. The blue waters of the island and the sandy beaches are one of the main attractions of the island. The Simos beach is one of the most beautiful beaches on this island. There are many other amazing beaches on the island namely Lefki, Kologeras, Kontogoni, and Sarakiniko. The island also offers camping. The sunset experience from the island will be your lifetime experience. You must also know a few important things about Bora Bora islands. The port town on Symi was built on the Gialos port and it is popular because of the petite colourful houses on the seaside cliff and small churches that dot the city. A staggering view of the city is offered by the boat rides along the coast of the town as it circles the island. A number of beaches give tourists the best experience of the seaside with many boats bobbing on the scenery. The famous Panormitis monastery is another popular destination for tourists as it has a blend of 15th-century architecture and a serene environment. Symi Island has a beautiful town built around and that is one of the main attractions of the island. The colourful houses and beautiful churches will give the beautiful experience of the island. Syni I sone of the most famous Greek Islands. The water is still so the boat riding along with the family is one of the finest things you will do in the Greek Islands. You should visit the Panormitis monastery located in the Southern part of the Island. The monastery has been built in the 15th century and it is dedicated to Archangel Michael. The island is also home to many crystal clear water beaches. These Islands have not just the most exquisite Mediterranean beaches but also eye-catching villages, ancient monuments and sites, churches, water sports and natural beauties. There is perhaps no other place that offers something for everyone. Before you go to the Greek Islands for a vacation you will love to know about largest islands in the world. When will you be planning your vacation to Greece? VIDEO: Exploding iceberg in Antarctica!